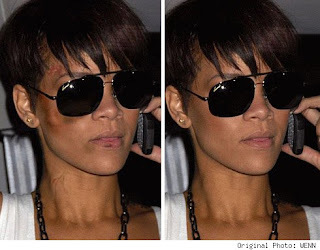 Rihanna's alleged bruised face pictures have been circulating the Internet. Apparently, it was just photoshopped. Without the original photo on the right, it would look like a legitimate picture to me. Not only can Photoshop can make celebrities thin and flawless in magazine covers, it can also turn a celebrity into a battered one. The "Umbrella" singer, which was domestically hurt by Chris Brown before the Grammy Awards had two major contusion on the head, split lip, bite marks and a bruised face. Chris Brown will be on court this March 5th. wow they looked so real. oh well, technology can be so real at tyms. good thing we still can discern real from counterfeit. Oh.. that's gross. But who knows what's the truth? They themselves know it but with so much trick they do these days to have free publicity, who can be trusted any more?